I’ve been deliberately shopping my own wardrobe for a number of months now, mainly because my wardrobe for both Autumn/Winter and Spring/Summer is pretty good in terms of ticking all the boxes for what I need in my lifestyle. Some bits have cropped up like a new blazer for work appointments, a new coat for walking our new puppy and a new dress for Winter events. With all of these purchases I got them either in the sale or with discount codes and I thought about the purchases versatility many times over, and about how to wear them again and again. During this time I have learnt alot about reworking pieces that I own into new outfits and learnt that it is more of an attitude that leads to a naturally more sustainable way of life when it comes to shopping and spending money. Don’t get me wrong, what I do for a living sees me advising men and women on what to buy for their wardrobes to make them feel good and more stylish. But I am always giving clients brands I know are great for quality, longevity and versatility so that you will keep these items for as long as possible in your life. 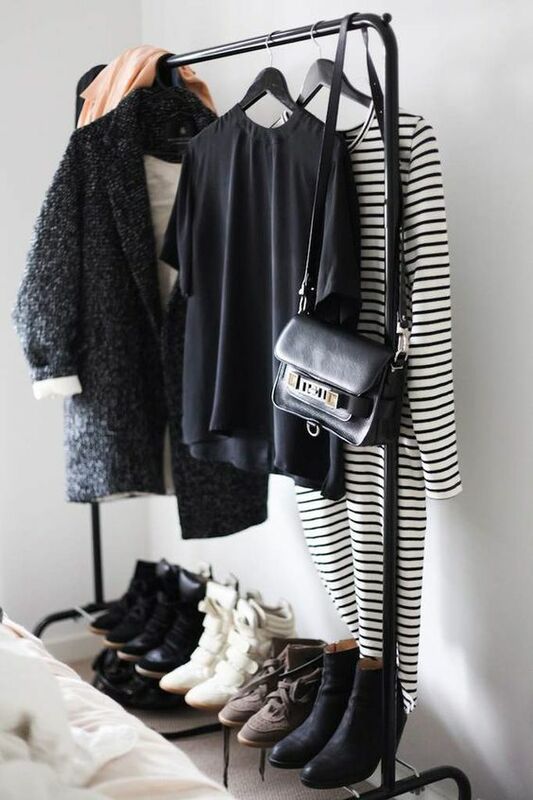 That is what I have done with my wardrobe over the past 5 years, jumpers I am still wearing now are old Zara, Topshop and &other stories buys but paired over dresses, with skirts or tucked into trousers they look new again. I still have small holes in my wardrobe and there are going to always be things that I lust after because I love fashion and style, but I think personally I want to be more conscious about my spending, where I am spending and really thinking about whether I NEED it in my wardrobe. During the past few months, I’ve learned a lot about the ins and outs and ups and downs of shopping your wardrobe so I have pulled together some tips for you to think about this January. Shopping your wardrobe is a way of thinking and feeling about your wardrobe that has you appreciating and using what’s there, not wishing for things that you don’t have. You can cultivate a ‘shop your wardrobe’ attitude overnight – there’s no special skills or steps required. The main ingredient you need is a new lens or a fresh set of eyes to look at, and experience, your existing wardrobe through. A working wardrobe that you can shop in usually takes a while to develop and get right, years sometimes. This is where I can help you on your journey and believe me it will be worth it. By bringing your focus solely onto the items that you already have, you have a chance to define for yourself what you truly love when it comes to clothing and style. You can’t tap into your true style when you’re always shopping in the stores as there is too much noise going on you can’t possible hear what your inner style voice is telling you! When you shop your wardrobe, you have a great opportunity to explore and discover what about your existing items really works. What items make your heart sing and makes you truly happy. What items make you feel most YOU. And of course, what items don’t pass muster. When you shop your wardrobe, you have the opportunity to evaluate items in your wardrobe by detoxing; reusing and recycling. All of the above is achievable but if the idea of it scares you, you don’t know where to start or you want to the help of a professional then I can get the results you are after by booking a consultation with me.